These road closures will be put in place as we evaluate the size of the crowds downtown and closure times may vary. We will be posting updates on Facebook and Twitter as we close the roads. We STRONGLY recommend taking public transit to Salem. 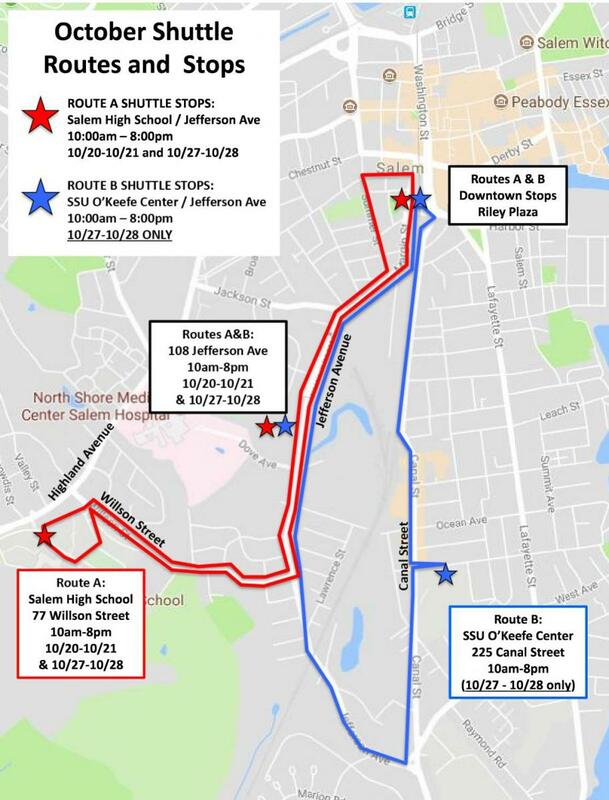 The MBTA Commuter Rail's Salem Depot station is only steps from downtown Salem and will be running trains regularly throughout the weekend. There are multiple garages along the rail line, including Lynn and Beverly. On the weekends the T is running a special $10 all you can ride fare. Restaurant Row to Memorial Drive to Szetela Lane to right to Webb Street. Webb to left Andrews crossing Washington Square into the common exiting at Forrester Street. Washington Square East right to Essex Street, left onto Hawthorn Blvd. Left on Derby Street to Fort Ave to Winter Island Road. Winter Island back to Columbus Sq. turning right to Columbus Ave right onto Bay View, Left on Cheval, a left onto Beach Ave and left on to Columbus Ave straight out to Fort Ave going back to Fire prevention bldg. going right on Memorial drive to Rest Row for Finish. We do not plan on any road closures for the race, however drivers should exercise extra caution while the runners are out. As always follow us on Facebook and Twitter throughout the weekend for important updates. If you have an emergency or see something suspicious dial 911. For non-emergency incidents you can contact us at 978-744-1212. Although we monitor our social media accounts please do not submit tips or requests for the police through them, you will get the best response by calling directly. The following are planned road closures for the October 2018. 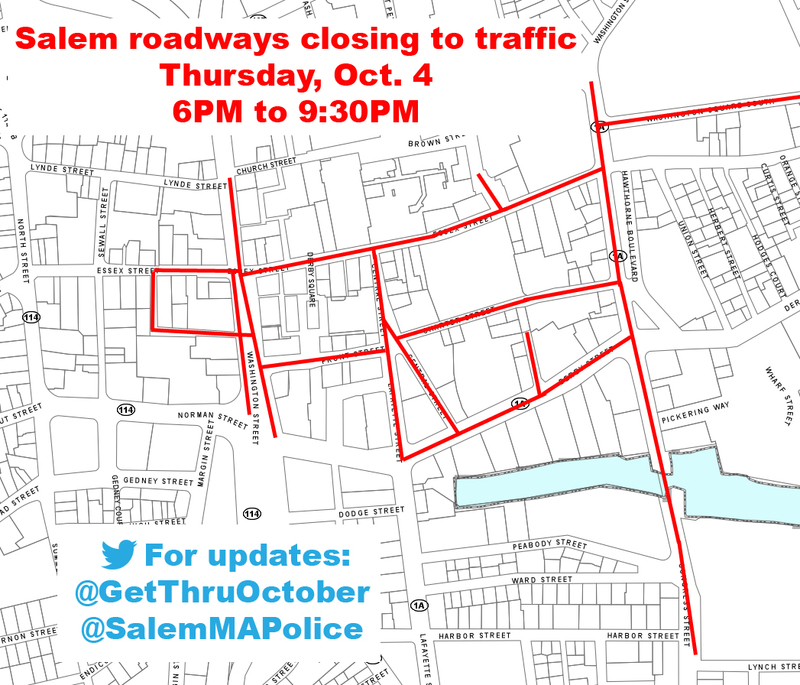 It is important to note that although the Salem Police make every effort to preplan road closures we will close any roads as deemed necessary without notice to ensure public safety. October 6 & 7, 13 & 14, 20 & 21, and 27 & 28: Essex St from Hawthorne Blvd to New Liberty St and Essex St from Barton Square to Washington St will be closed to through traffic and no on-street parking will be allowed from 6am to 10pm every Saturday and Sunday. Access to Museum Place garage will be via Brown St only. October 13: Salem YMCA Witch City 5K road race starts at 9 am at the Salem Willows. 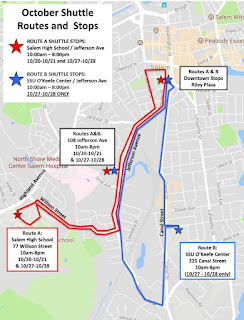 No road closures are planned, however anticipate traffic impacts along the following roadways: Memorial Drive, Essex Street, Route 1A, Route 114 including Hawthorne Boulevard, Derby Street, and Fort Avenue, ending at Restaurant Row. October 14: MDA Witch Ride Motorcycle Ride. Route 114 and Route 1A will be impacted, but not closed to traffic, from Marblehead to New Derby Street. Route 1A, including Derby Street, will be closed to traffic between Lafayette Street and Congress Street. Congress Street will also be closed to traffic. Anticipate road closures and traffic impacts from noon to 3 pm. There will be a no parking tow zone on Derby Street between Lafayette Street and Congress Street from 11 am to 3 pm. October 16: November 2: Federal Street westbound from Washington Street will be closed and traffic needing to access that block of Federal Street must do so by turning right off of Bridge Street onto the courthouse access road and then turning right onto Federal Street; no left turn will be permitted off of Bridge Street onto the courthouse access road. October 27: Devil’s Chase road race starts at 8 am at the Salem Willows soccer field on Fort Avenue. No road closures are planned, however expect traffic impacts until 10:30 am on the following roadways: Fort Avenue, Derby Street, Szetela Lane, Webb Street, Andrews Street, Washington Square, Essex Street, Charter Street, Derby Street, Winter Island Road, Columbus Avenue, Restaurant Row, and Memorial Drive. Several no parking tow zones will be posted on Memorial Drive, Victory Road, and Larkin Lane. October 31: The cruise ship Seabourn Quest is scheduled to arrive at the Footprint dock. The Salem Wharf parking lot on Blaney Street will be closed during the ship’s one-day visit. October 31: Halloween events will include multiple road closures and heavy traffic impacts for the entire day and night. 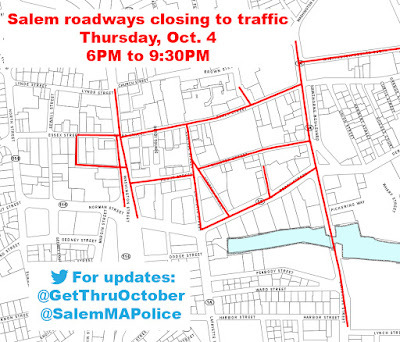 Visitors are strongly encouraged to take the commuter rail or ferry to get to Salem. Expect major traffic impacts on Route 114 and Route 1A. Downtown streets will close to all traffic no later than 4pm. Road closures include: Essex Street at Crombie Street and Barton Square to Union Street, Washington Street from New Derby Street to Bridge Street, Federal Street from St. Peter’s Street to North Street, Washington Square North and West from Essex Street to Brown Street, Hawthorne Boulevard, Derby Street, Route 1A, Congress Street near Pickering Wharf, Charter Street, Central Street, Front Street, and Lafayette Street from New Derby Street to Front Street. Bridge Street at Sgt. James Ayube Memorial Drive will also close to all traffic between the westerly overpass ramps and Sgt. James Ayube Memorial Drive from 9:30pm to 11:30pm for the closing fireworks. Please note: the MBTA Garage will be closed from 8:00 p.m. until 1:00 a.m. on Halloween night. Cars will not be permitted to enter or exit between these hours. The 23rd annual Haunted Happenings Grand Parade will be on Thursday, October 4th, 2018 starting at 6:30 pm. The parade will muster at Shetland Park and follow a route up Congress Street, left onto Derby Street, right onto Central Street, left onto Front Street, right onto Washington Street, right onto the pedestrian mall, down Essex Street, and onto the Common. Roads will be closed down around 6:00 pm and remain closed until after the parade. There is no parking allowed along the parade route. For more information visit the Chamber of Commerce Website.